For the Red Arrow cake pictured I used the Madeira Sponge Cake Recipe and cooked it in a loaf shaped tin. I also used the Gelatin Icing recipe and colored it red to make the wings. Gelatin Icing needs several hours (preferably overnight) to dry and harden preferably turning half way, so I suggest doing this bit first to allow drying time. Once the sponge was cooked and cooled I used a sharp knife to shape the front end of the cake into a more pointed shape like the front of a plane would be. I sliced the cake in half and added buttercream and put a thin coat of butter cream across the top of the cake to help hold the sugarpaste icing in place more firmly. 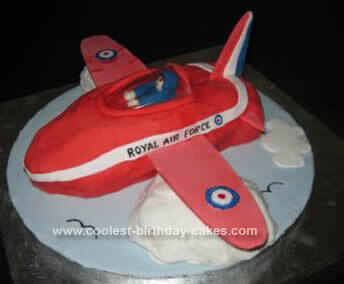 I rolled out my red sugarpaste icing and covered the plane. I then made slits in the sides for the wings which I had made earlier and allowed to dry and harden. Once the wings were in place and supported by clouds made from cut off bits of sponge covered in white sugarpaste I began to decorate the plane with patterns as shown in my print off picture of a red arrow plane I had found online. This included the white stripes down the sides with Royal Air Force written on them and the circular patterns on the wings. It took some time to add the finer details and the sugarpaste man in the cockpit made from a section of clear plastic cut from a squash bottle but those are the details that make the cake extra special and give it the wow factor. It is great to be able to share tips and pictures with others to show that these cakes though they may look difficult are actually quite easily achieved by amateur bakers with a few simple things and time and patience. These ingredients are suitable quantities for either a 6 inch square tin, 7 inch round tin, 1 liter pudding bowl or 2 lb loaf tin. Pre-heat oven to 150 degrees Celsius / 300 degrees Fahrenheit or Gas mark 2. Sift flour into bowl and add all the other ingredients, mix together carefully with slow setting on mixer, once mixed together increase mixer speed to higher setting and beat for one minute. Place the water into a small heatproof bowl, sprinkle the sachet of gelatin onto water and leave to soak in for about 2 minutes. Sieve the icing sugar into a large mixing bowl and make a well in the centre. Place a small amount of water into a large saucepan, stand bowl of gelatin mix in saucepan and gently heat water until gelatin dissolves. Once dissolved remove heatproof bowl and add in liquid glucose stir in and leave to cool for a couple of minutes before pouring into well in icing sugar. Stir gelatin mixture into icing sugar until it binds together, then knead into a bread dough consistency adding cornflour as required (if you want to color the icing now is a good time to knead in the coloring paste) then place into plastic bags until required.